Nokia is bringing its phones downmarket with the 105 entry level phone, trying to reach those 2.7 billion still without a cell phone. The Nokia 105 features "a bright color screen with clear menus and essentials like FM radio; multiple alarm clocks; speaking clock; a dust and splash-proof, pillowed key pad; and a flashlight. Its durability and up to 35-day battery life also make it ideal for people seeking a back-up device." 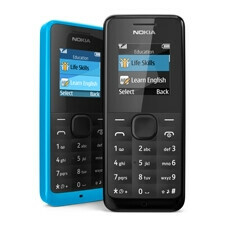 Nokia 105 will be available in black and cyan for a recommended price of EUR 15 (~$20). It is planned to start rolling out in Q1 2013 and is expected to be gradually expanded to in China, Egypt, India, Indonesia, Nigeria, Russia, Vietnam and other markets in Africa, Middle East, Asia-Pacific and Europe. Is this the new nokia flagship?? No wonder all the nokia fanboys are so upset! Sammy = octacore. Nokia = this?? c'mon my friend.. as a samsung fan i hope we're not trolling others..
No wonder you are so happy with Samsung's Octacore hype. And if modified by custom roms and all.we could run both cpu's at the same time. that's cute. should be a sensible backup for some. For that price I might buy one and put a pay as you go sim in with £10 credit just to keep in the car in an emergency. I'd buy that for 35 day battery life!